Alexander Phimister Proctor was a known as the sculptor in buckskin. Born in Canada, he fell in love with the American West and most of his work featured the West. However, he didn’t only sculpt, he occasionally painted. 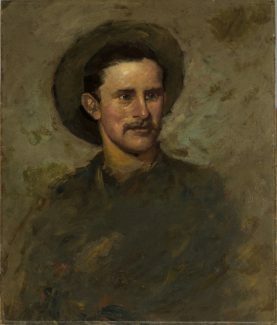 Proctor’s Self Portrait is a painting of the artist in his early 20s. Karen McWhorter, the curator of the Whitney Western Art Museum, said the portrait proves Proctor as a talented painter not only a talented sculpture. The Center of the West has Proctor’s studio collection, which includes photographs from his life, his papers, and archival materials. When comparing the early photographs of the artist with the self-portrait, it is faithful to how Proctor looked. The self-portrait is quite a bit more painterly than any other paintings Proctor painted due to obvious brush strokes and the concentration on the face as the background dissolves behind it.